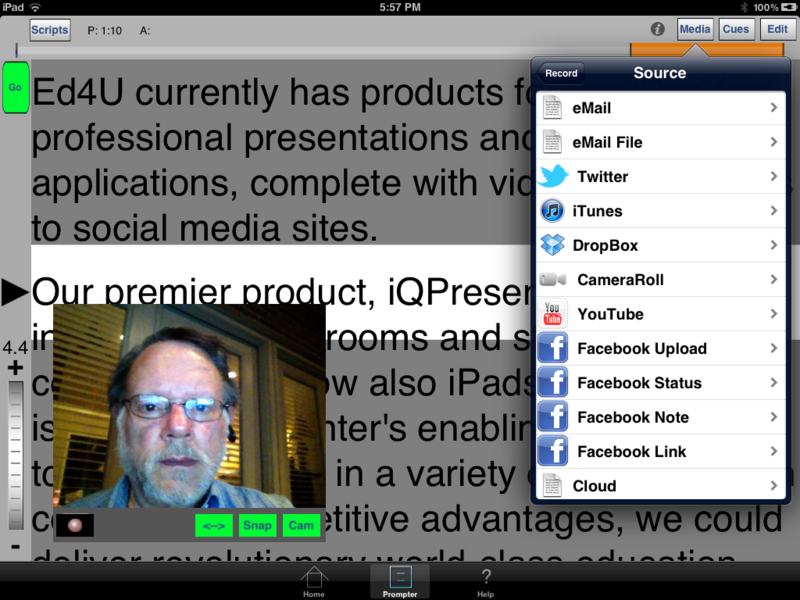 The iQPrompter Suite is the most full featured set of teleprompter apps available on the iPad. Whether professional newscaster or individual presenter, everything you need to create, practice, deliver, and post-analyze your speech is here. You can adjust the appearance any way you want, including text flips for mirrored displays, output simultaneously to an external monitor/teleprompter screen (with independent filps), record your speech for practice or analysis, monitor your actual progress in real time with relative indication compared to planned time, set cue points for segment retakes, and much more. iQPrompter now supports not only audio recording/playback (now using any codec available on the iPad), but also video recording/playback, photo storage, and a multitude of import/export options, including DropBox, FaceBook, Twitter, AirDrop, iCloud, and YouTube. You can write your speech, use the prompter as you make a video recording, upload the video to YouTube, then immediately send out an announcement Tweet containing the video URL. iQPrompter Studio add "Events" and "Playlists" for lyrics, and allows you to use multiple synchronized teleprompters, any of which can control operation. iQPrompter Remote shows the full teleprompter screen and provides basic controls and Cue Points. Suggestions for other ways to handle video. The easy import/export capabilities of iQPrompter allow many other options, besides the large number of included features. For example, besides importing videos/images from external sources, videos can also be exported to CameraRoll, where they are accessible to the iMovie iPad app. There, they can be edited and combined with other video clips and still images. They can then be reimported to iQPrompter, or uploaded directly to vimeo or to CNNiReport.